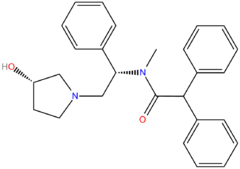 Asimadoline (EMD-61753) is a drug which acts as a peripherally selective κ-opioid receptor (KOR) agonist. 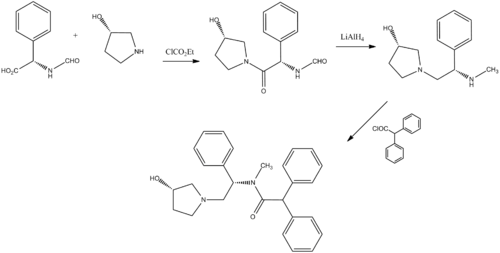 Because of its poor ability to cross the blood–brain barrier, asimadoline lacks the psychotomimetic effects of centrally acting KOR agonists, and consequently has more potential for medical use, and has been researched as a possible treatment for irritable bowel syndrome, with reasonable efficacy seen in clinical trials. ↑ Barber A, Gottschlich R; Gottschlich (October 1997). "Novel developments with selective, non-peptidic kappa-opioid receptor agonists". Expert Opinion on Investigational Drugs. 6 (10): 1351–68. doi:10.1517/13543784.6.10.1351. PMID 15989506. ↑ Camilleri M (September 2008). "Novel pharmacology: asimadoline, a kappa-opioid agonist, and visceral sensation". Neurogastroenterology and Motility : the Official Journal of the European Gastrointestinal Motility Society. 20 (9): 971–9. doi:10.1111/j.1365-2982.2008.01183.x. PMC 2698012 . PMID 18715494. ↑ Delvaux M, Beck A, Jacob J, Bouzamondo H, Weber FT, Frexinos J (July 2004). "Effect of asimadoline, a kappa opioid agonist, on pain induced by colonic distension in patients with irritable bowel syndrome". Alimentary Pharmacology & Therapeutics. 20 (2): 237–46. doi:10.1111/j.1365-2036.2004.01922.x. PMID 15233705. ↑ Szarka LA, Camilleri M, Burton D, Fox JC, McKinzie S, Stanislav T, Simonson J, Sullivan N, Zinsmeister AR (November 2007). "Efficacy of on-demand asimadoline, a peripheral kappa-opioid agonist, in females with irritable bowel syndrome". Clinical Gastroenterology and Hepatology. 5 (11): 1268–75. doi:10.1016/j.cgh.2007.07.011. PMC 2128734 . PMID 17900994.